Police were called to a medical emergency at his Paisley Park estate earlier on Thursday, US media reported. An investigation is underway. Born Prince Rogers Nelson in 1958, he was a prolific writer and performer from a young age. 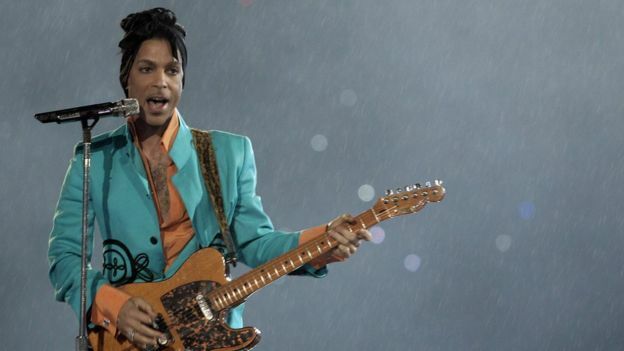 A singer, songwriter, arranger and multi-instrumentalist, Prince recorded more than 30 albums. His best known hits include Let's Go Crazy and When Doves Cry. He also built a reputation for secrecy and eccentricity, once changing his name to an unpronounceable symbol. In 2004, Prince was inducted into the Rock and Roll Hall of Fame, which said he "rewrote the rulebook". His latest album, HITnRUN Phase Two, was released last year and he had been touring as recently as last week. On 15 April he was rushed to hospital hours after performing on stage, but was soon released. At the time he reassured fans he was feeling much better and was resting at home. A musical prodigy from a broken home, Prince famously wrote, arranged, produced and played almost all of his hit records. But the Purple man's purple patch really came with his first band The Revolution. With them by his side, he wrote more than two dozen rock classics in a five-year flurry. Purple Rain, Little Red Corvette, 1999, Raspberry Beret, When Doves Cry, Kiss... At the same time, he dashed off Manic Monday for The Bangles and Nothing Compares 2U, made famous by Sinead O'Connor. In the studio, he was unstoppable. But the magic really happened on stage. He would vamp, preen and tease an audience into a frenzy, then slay them with a quiet moment of crystalline beauty. He was a joy to watch. Tributes have been pouring in on social media and fans have been gathering at Paisley Park. Chic guitarist Nile Rogers said there were "tears and love on our tour bus". Pop star Katy Perry said "the world lost a lot of magic". Director Spike Lee said: "I Miss My Brother. Prince Was A Funny Cat. Great Sense Of Humour." "Numb. Stunned. This can't be real," wrote Justin Timberlake, while Boy George said: "Today is the worst day ever. Prince R.I.P I am crying!"